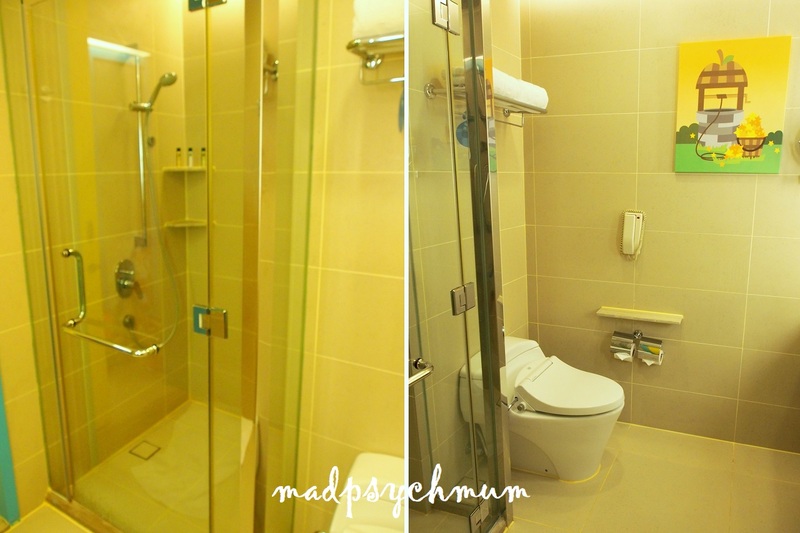 We drove from Kuala Lumpur back to Johor Bahru and made a stop at Hotel Jen Puteri Harbour. 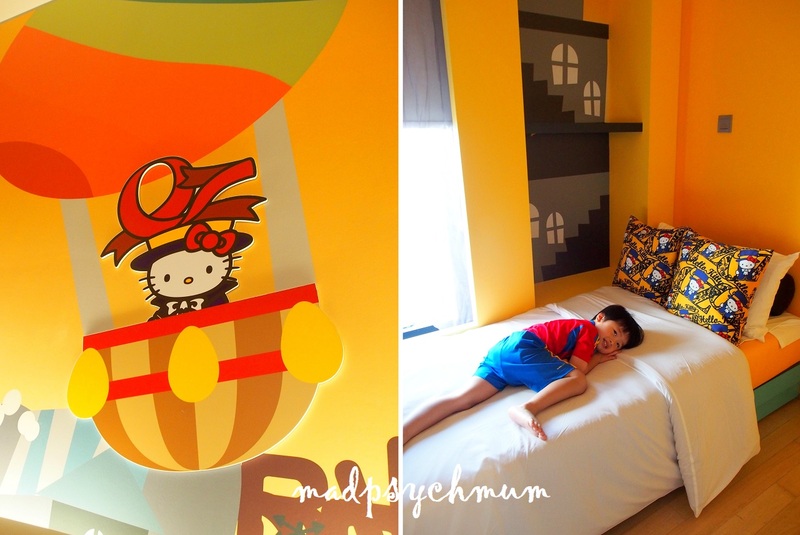 We chose to stay one night there as they had Hello Kitty themed rooms! 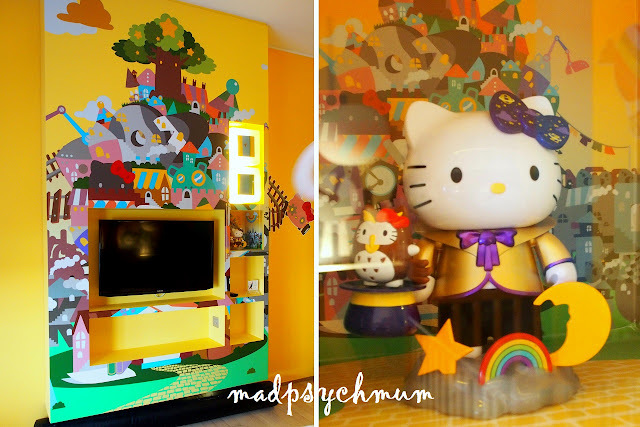 You know how much I love themed rooms right? 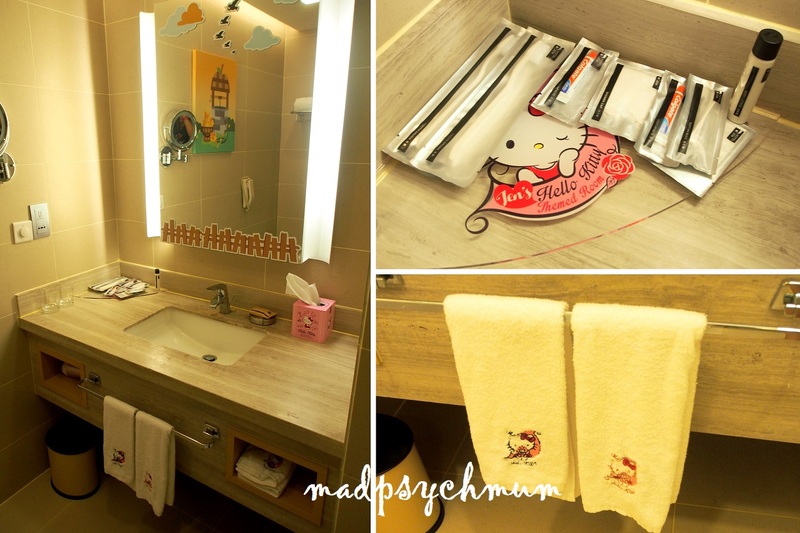 We've stayed at Legoland Hotel and the Beauty & The Beast room at Tokyo Disneyland! 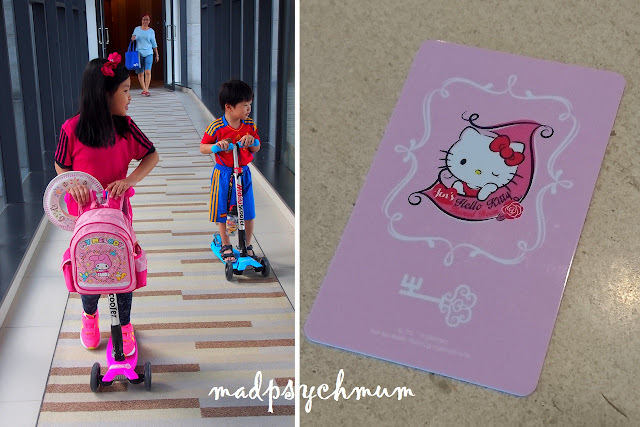 And much as I hate to admit it, everyone around me has observed that I'm really a closet Hello Kitty fan (*laughs*). Gotta admit that she's really cute! 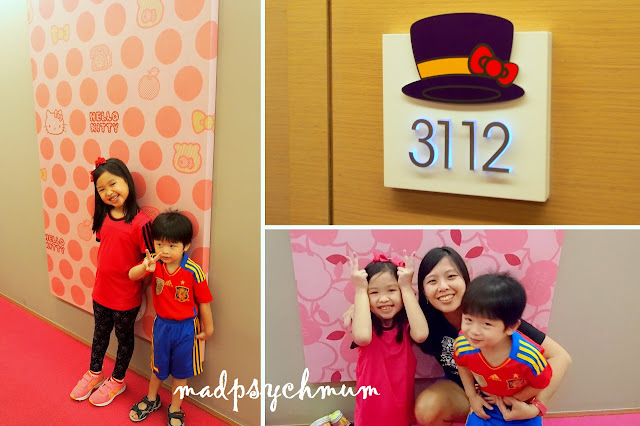 There are 3 designs of Sailor Hello Kitty rooms, 3 Hello Kitty in Oz rooms and 4 Hello Kitty Pink Series rooms. Being the pink lover that I am, of course I wanted the pink rooms! Unfortunately, we could only state our preferences but were not guaranteed the design of room that we'll get as it's based on availability. The symbol on your room door number will give you a hint of the design of room that you got. Can you guess ours? Hello Kitty in Oz themed room! We booked the Deluxe Theme Double Bed for 3 Adults (with breakfast) and added a baby cot. It was a tight squeeze but we managed to fit all 5 of us comfortably. 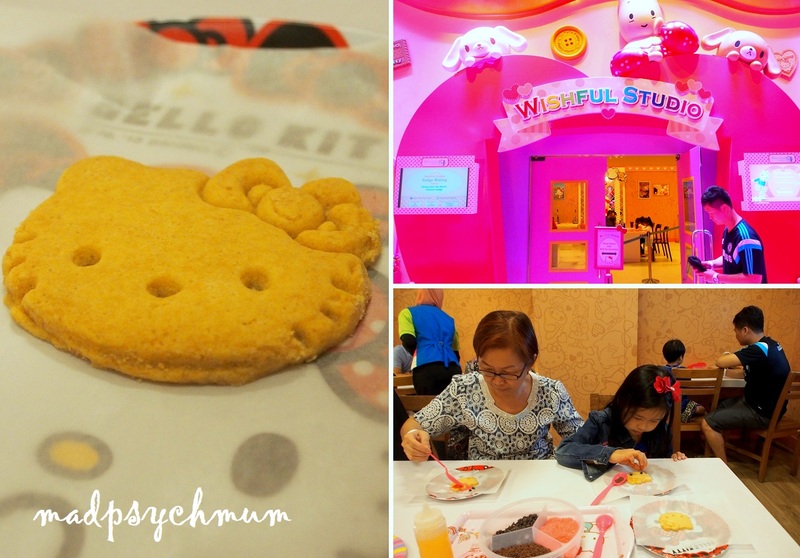 The room cost us SGD 347.49, which wasn't cheap but considering that we got breakfast for 5 and 2 Two-Park Admission tickets to Hello Kitty Town and Thomas Town (worth MYR 125/ SGD 41 each), it wasn't so bad. Love the cushions and decorations on the wall! So pretty! Cute Hello Kitty decorations on the wall, counter top and the towels! Each room is also given a really cute goodies bag filled with awesome Hello Kitty stuff! 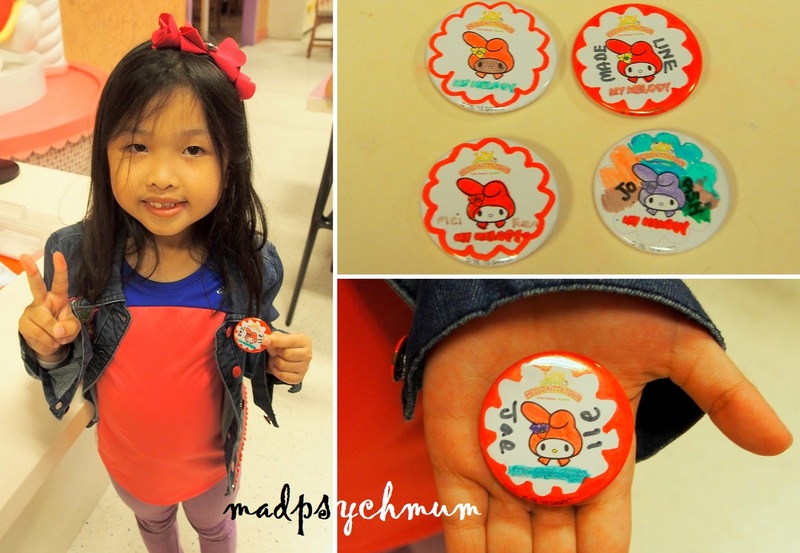 Super duper cute! We checked out the pool located in the same building. I liked that the jacuzzi pool was so warm and nice. The next morning, we had breakfast at the hotel's restaurant. The spread was pretty decent and the food was not too bad. 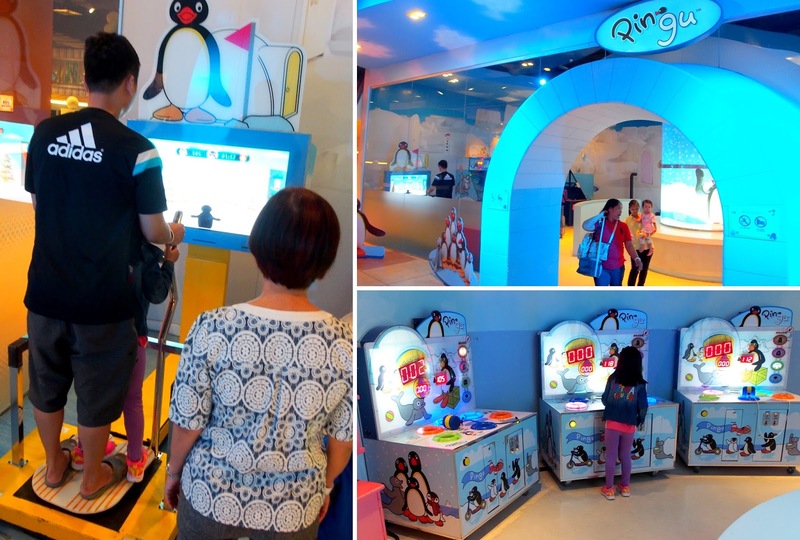 After breakfast, we crossed over to Little Big Club to visit Hello Kitty Town and Thomas Town. We've been to Hello Kitty Town previously but have never been to Thomas Town so we were really excited. It's more worth it to get the Two Park Pass at MR 125 than single park admission ticket at MYR 85. 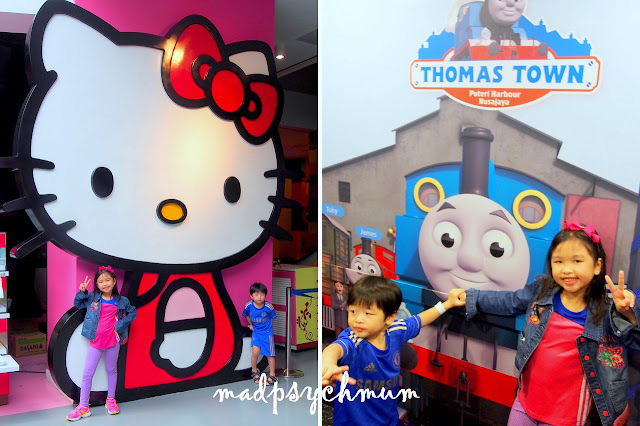 The kids were so excited to visit both Hello Kitty Town & Thomas Town! 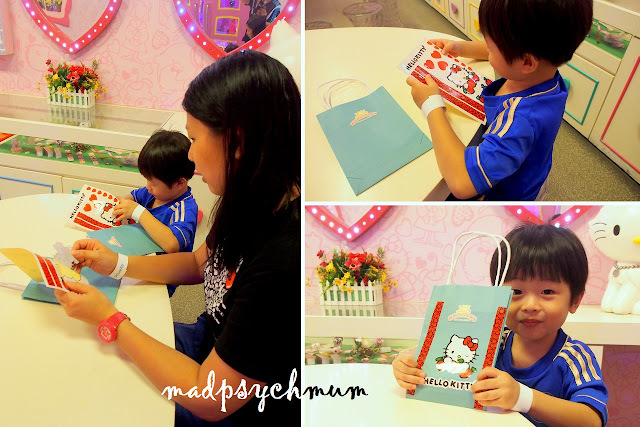 As usual, we started with Sanrio Hello Kitty Town located at the 2nd level. Love this mural on the wall! Since we had done all the activities at the Wishful Studios the last time, we decided that we would only do our favourite ones this time (please see my last post for a list of all the activities that you can do!). 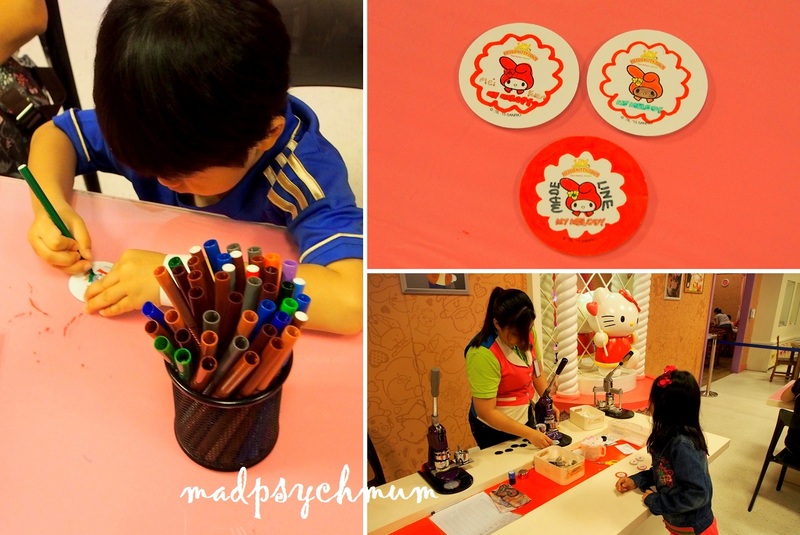 Now that my boy is almost 4 years old, he can truly appreciate the activities and remember the experience! My favourite photo of the trip! We proceeded up to the 4th level to visit Thomas Town next. We were really hungry so we had lunch at the Mc Bunn Cafe. This set comes with a Thomas toy!! My boy loves it! The kids love riding Bertie The Bus so much that they went again and again! 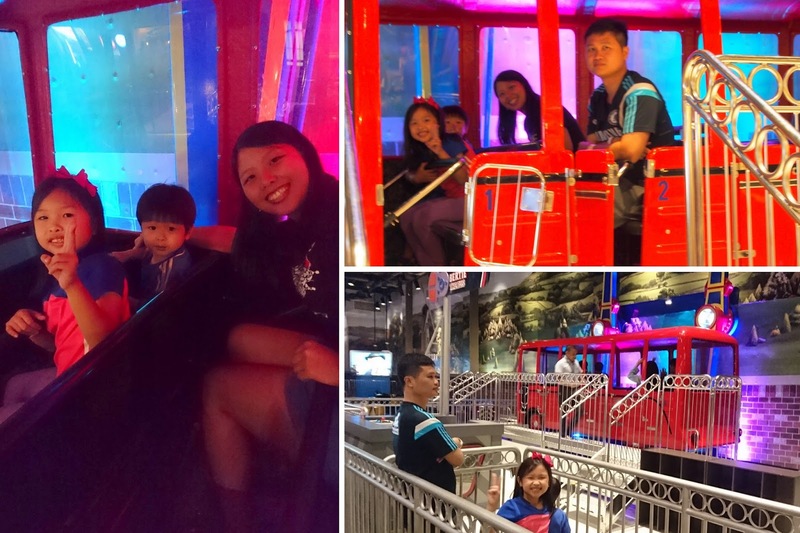 We also had fun at the bumper cars although I don't have any photos! 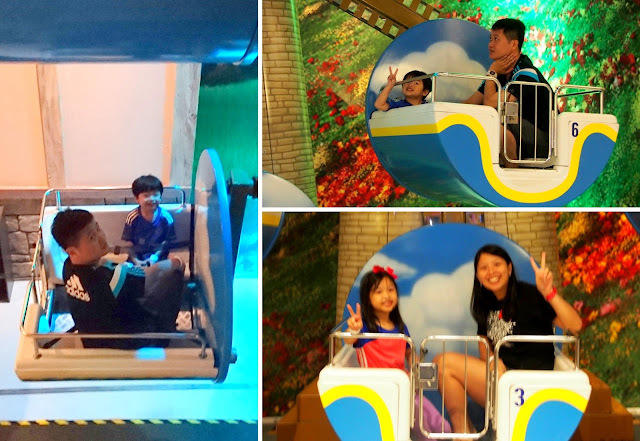 A visit to Thomas Town is not complete without a ride on Thomas the Train himself! It's not easy to navigate this playground as an adult. I think if you are slightly rounder, you'll probably get stuck halfway! But I managed to squeeze through and found myself in the heart of the playground with three trains staring at us! It is a nice back drop for a photo but younger kids will probably be freaked out! The Thomas Town ticket also includes entry to the 3rd level where Barney, Bob the Builder and Pingu are. We ended the day with a Thomas and friends live performance at the stage. With that, we ended our short weekend getaway to Malaysia. This is not our first and definitely won't be our last! We'll be back!